Facts are evidence used to build a truth, which is a very fluid thing. The truth Phil Miller has set out to prove is that “the British State colluded with the Sri Lankan State in its counter-insurgency operations against Tamils since the 1980's,” says Dr N. Malathy, a key member of NESoHR and the author of ‘A Fleeting Moment in My Country’. Phil's latest report, “Exporting Police Death Squads” identifies a person, the late Jack Morton, his career path, and his report, “Morten report”, which was produced for Sri Lanka’s counter-insurgency operations against Tamils. The so-called Morton report is still kept secret by the British State, Phil Miller's research has revealed. Phil Miller, a researcher for Corporate Watch in London, gave expert evidence on British State complicity in genocide of the Tamil people at the Permanent Peoples’ Tribunal on Sri Lanka (Bremen Session). His earlier report, ‘British State complicity in genocide of the Tamil people, has been translated into Tamil and published in Germany and in UK this month. Facts are evidence used to build a truth which is a very fluid thing. 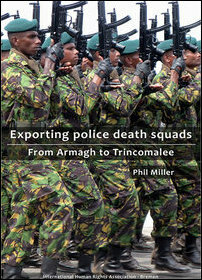 The truth Phil Miller has set out to prove is that “the British State colluded with the Sri Lankan State in its counter-insurgency operations against Tamils since the 1980’s”. He has documented abundance of facts using unclassified documents, memoirs, books, obituaries, news paper articles, court proceedings, reports etc. His latest report, “Exporting police death squads…”, is a stunning effort of unearthing facts. Through the facts he unearths the truth emerges. Phil starts this report by identifying a person, the late Jack Morton, his career path, and his report, “Morton report” which is still kept secret by the British State. This person was a special forces officer in India and engaged with counter-insurgency operations during the Indian independence struggle. He later engaged in similar operations against the Maoists in Malaya. His next major involvement was in the counter-insurgency campaign in Northern Ireland. With this background and his self proclaimed racist views on Indians, he wrote the “Morton report” for Sri Lanka’s counter-insurgency operations against Tamils. Phil then describes the development of the British Special Support Unit (SSU) for counter-insurgency operations in Northern Ireland. He then sets out to show the adoption of this method for the counter-insurgency in Sri Lanka with the creation of the Special Task Force (STF) unit. Tamils need no further explanation about STF and its murderous activities in the Tamil areas, starting in Jaffna in mid-80’s and extending into the east even as late as 2006 when 10 Muslims in Poththuvil in Amparai district were gunned down by the STF. One man survived to tell the tale. Phil unearths British concerns about the direct involvement of British State in Sri Lanka’s counter insurgency - above mentioned Morton report is but one example of this direct involvement. Then followed the involvement of the KMS services, a private security firm. Ex-British SAS officers could now participate directly in the Sri Lankan counter-insurgency efforts as mercenaries through the KMS services. Britain could now deny and did deny involvement by distancing itself from the KMS services. Phil unravels the British denial through more facts. One of the KMS mercenary Robyn Horfall spoke to Phil. Horfall identified several key people in KMS as ex-British officers. One of them is Brian Baty who was heavily involved in the Northern Ireland counter insurgency operation. IRA once tried to assassinate him but he escaped, retired and was honoured with an MBE. He later headed the KMS services. Phil’s efforts are outstanding given the difficulty in accessing such facts. Tamils need to reflect on why none of the second generation Tamil Diaspora members with their background in western education are unable to produce such reports. On the contrary, young diaspora members working in academic and other institutions in the West continue to produce ample “facts” about the “atrocities” of the LTTE. Is it because efforts such as Phil’s can mark you as a “threat to security” while doing the latter will make you a celebrity in eyes of the Establishment? 04.08.17 Occupying Colombo steps up militarization of Jaffn..
23.04.17 SL Police ranks first in appropriation of private ..
19.03.16 Colombo proceeds unabatedly with military, STF dep..
09.05.15 British Tamils should start backing Scottish Natio..
24.03.15 Report unearths more facts on UK’s role in Sri Lan..
30.07.14 British-trained STF brings night terror back to Ja..
23.07.14 British writer blasts UK's unscrupulous arms-deals..
10.07.14 British State complicity in genocide of Eezham Tam..
04.12.13 Reminding Britain of its geostrategic injustice ag..